At the end of the Late Bronze Age, around 1200 BC, there were bad times all over the Mediterranean and West Asia. The Egyptian New Kingdom collapsed, and so did the Hittite Empire. We don’t exactly know why. It may have been a change in the climate, which caused a drought and food shortages, but it might be something else. Whatever the reason was, a lot of people decided they had to leave their homes and move someplace else, to look for a better life. 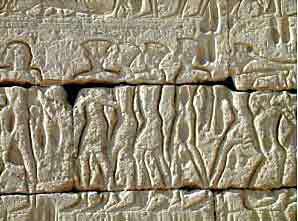 The Egyptians called these invaders the Sea Peoples. One of these groups of people was the Philistines. 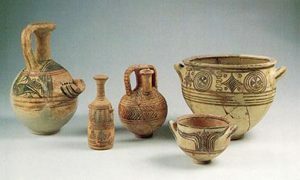 They seem to have been a group of Mycenaean Greeks who left Greece and the islands of Crete and Cyprus in order to look for a better life along the Mediterranean coast of West Asia (modern Egypt, Israel, and Lebanon). The Philistines lost their battle with the Egyptians, but thanks to their iron weapons, they were able to defeat the Jews in Israel (this is told in the Bible under the story of Samson). But after a while the Jews broke free again, and established their own kingdom (this is the story of David and Goliath). Our word Palestine comes from these Philistines – the Greeks! People of the Sea: the Search for the Philistines, by Trude and Moshe Dothan (1992). This book was the first to really argue that the Philistines were Greek, but the case has been made more strongly since this was published. Philistines: Giving Goliath His Due, by Neal Bierling (2002). More up to date, but less expert. Cite this page: Carr, K.E. 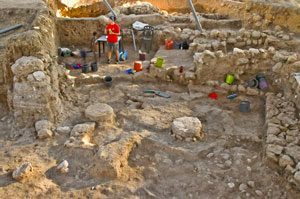 Who were the Philistines? West Asian history. Quatr.us Study Guides, September 14, 2017. Web. April 18, 2019.